Today will forever more at West Wing Towers be known that the day that the internet died. And die it did, albeit unspectacularly. The first I knew that anything was wrong when the entire office leapt to attention like meerkats in sight of a predator, with hushed voices exclaiming, “the internet’s down”. Shocked glances turned into furious keyboard tapping, phone calls across the office to the techies who know about this kind of stuff, and quickly led to meetings being disturbed by nerd-like shrieking. In fact, this was a real life emergency. The root cause had to be found and rectified as quickly as possible, how could we survive without instant access to the world wide web? This meant that people actually left their desks and headed to the mother ship, well the temperature controlled security vortex also known as the server room. They were on a mission, they would succeed in bringing back the internet or die trying. It turns out that someone had tripped up and subsequently pulled out the ONE really important cable. He was explaining to some colleagues how careful you need to be when you’re backing up the system, being very serious and spouting good practice. It was an unfortunate and somewhat ironic accident. Alas, this was a serious security breach and the ISMF (Information Security Management Forum – I’m not making this up) had to be informed. An incident was duly recorded, and will be discussed at the next meeting of the ISMF. Once we rebooted the internet all was well. The nerds settled back down into coding heaven, the geeks could get back online and order suitably geeky stuff and I could carry on shopping. 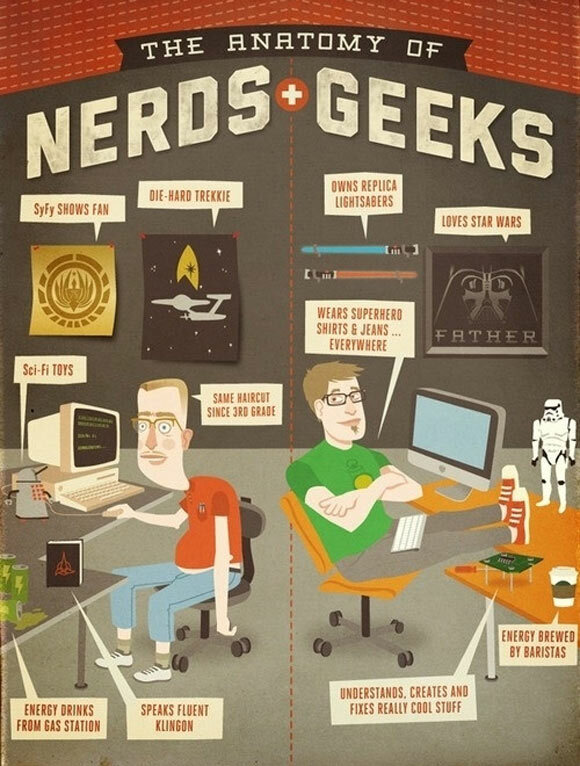 For those of you lucky enough to work outside the technology sector I shall clarify the difference between nerds and geeks via the image below. Welcome to my life, I work with both tribes. No wonder I buy shoes.